Designed to protect electrical wiring from dirt, dust, oil, and water. 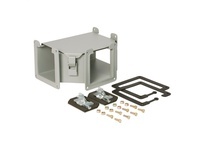 All straight sections and fittings feature an open-top design for easy “lay-in” of wiring. No “pulling through” of wires and cables is required with this design. A complete selection of straight sections and fittings are offered in five sizes. Carbon steel tee top-opening fitting. For use with LJW Series lay-in wireway.